A collective of action sports producers videos that inspires youth and the young at heart. The alliance with Boulder Creek International allows broadcasting video content to international scale. Tribu Expérientiel produces its own content in its major events (Jackalope, Mud Rocker, Empire City Troopers, and Barbegazi), and represents other talented producers to encourage and to introduce the practice of action sports. A beautiful mix of adrenaline, stunning landscape, and inspiring athletes. JACKALOPE is the largest action sports event in Canada. The 6th edition is slated to take place on August 18 to 20, 2017 at the Sun Life Financial Esplanade at Montreal’s Olympic Park. It’s the event of the year for adrenaline junkies who come to enjoy a variety of events and activities, including initiations, demonstrations and international-calibre competitions. Our objective is to inspire people to be active and discover or rediscover the seven action sports that are featured at the event. Barbegazi, which means frozen beard and evokes Canadian’s love affair with all things winter, is set to take place on March at the Esplanade Financière Sun Life at Montreal’s Olympic park. The BARBEGAZI Festival is poised to become one of the biggest winter action sports events of its kind in Canada! Activities at this 4th edition include: freestyle snowmobile demonstrations, lumberjacks contest, snowskate and obstacles race. Experience Empire city Troopers presented by Fido & Monster Energy, an urban snowboard operation taking place in the heart of Montreal on the longest urban snowboarding course in Canada. Through the eyes of our invited riders, follow the evolution of the course and of the competition, now a must go contest to kickstart the season. MUD ROCKER, whose name is inspired by one London (UK) subculture in the 50s, is a mountain bike and BMX competition presented by Fido downtown Montreal in Canada. More than 40 athletes from 7 countries battled on the course to win the $4,000 cash price! The event is a bronze qualifier for the FMB World Tour. Discover the fourth edition of JACKALOPE présenté par FIDO, Canada’s biggest action sports festival with six adrenaline sports taking place a Montreal’s Olympic Park. Skateboarding, with the only stage of the World Cup on home soil, rock climbing, fixed gear, wakeskate, motocross and slackline. JACKALOPE is intense and full adrenaline. Experience the adrenaline of EMPIRE CITY TROOPERS, a snowboard operation taking place in the heart of Montreal on the longest urban snowboarding course in Canada. Discover the winter world of BARBEGAZI. 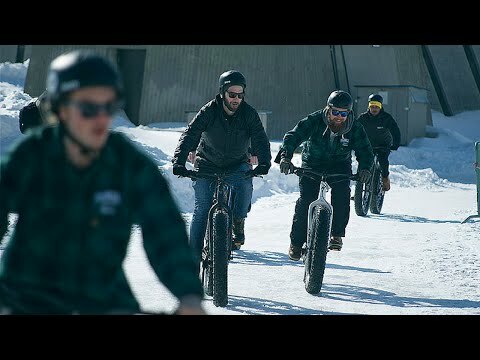 A festival that regroup action sports such as snow skate freestyle snowmobiling obstacle course, fatbike race and the STIHL TIMBERSPORTS competition. Strength, authenticity and adrenaline will be waiting for you!